Black Mamba V2 base frame kit fra Quadrysteria. Kulfiberramme til opbygning af meget hurtig FPV Quadcopter. Udbygget eksempel vises på de 3 nederste billeder. • Completed frame weight 252 grams! • Flight Controller mount slots accommodate 30mm - 45mm (hole center-to-center). • Solid through spar carbon fiber arm tubes isolate vibration, protect and conceal motor wires. Vibration isolation material at both the motor mount and the arm attachment point. No "dirty" section! • Rotatable arms. You can angle the rotors forward 5-10 degrees and gain an aerodynamic advantage and speed during forward flight. This also gets you an optimal view of the horizon from your FPV camera. • Designed for GoPro 3 or Mobius and full-size FPV gear (8-9” propellers). Its big enough to fly line-of-sight, yet small enough for agile FPV proximity fun! • 14 minute hover time on 3S 2200mAh 30C LiPo (no cameras or FPV gear) 9" propellers and 980kv motors. 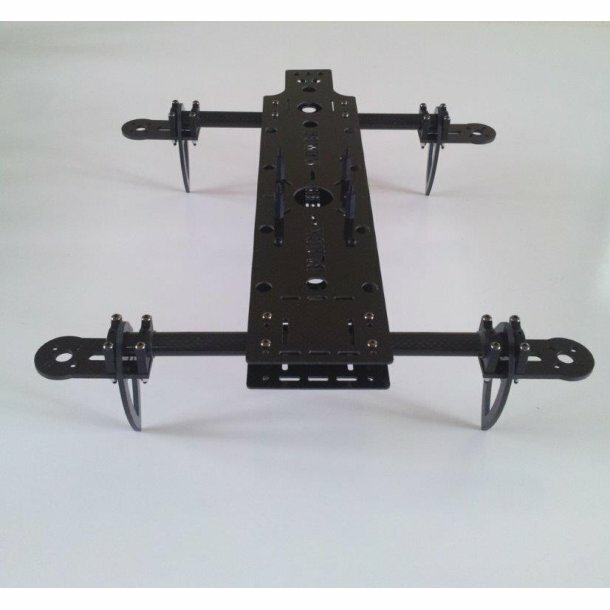 • Extra frame holes for camera mounts, servo wires, LEDs, and straps. 3mm size holes for nylon mounts or silicon bobbins. 9mm size frame holes for vibration dampers. • Integrated video transmitter bay gives a cleaner look, protects the transmitter, blocks RF bleed from the transmitter, and gives better balance with a nose mounted camera. • 5.8GHz Circular Polarized antenna pair ((SkewPlanar/Airscrew, Cloverleaf, Mad Mushroom, Crosshair, SpiroNet Patch, Helical).